Well, !@#$@!. I really, really wanted to get my blocks together for the quilt top on the Avalon jelly roll project. But, as it happens, I haven’t had a chance this week to sew for more than 15 minutes at a time. Some days, the most progress I could muster is pressing newly attached strips on perhaps 10 blocks. That’s it. Like 5 minutes or less. I’m soooo close too! I just have to attach the last strip to my 36 blocks and then cut the setting triangles and I can start my assembly. 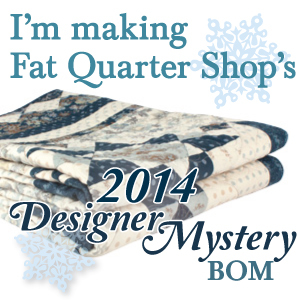 As soon as I have that done, I have my eye to jump in on the STARBURST sew along hosted by Happy Quilting. I ordered a fat 8th of Posy fabric by Aneela Hooey for Moda fabrics (along with four Bella solids that FQS pairs up with collection), and I think it will be adorable!! The bottom fabric swatch is what I will use for the background. CUTE! Hope you are able to squeeze more time into sewing this week than I am! I can’t wait to see what you make with the bundle when you get it. The Posy fabric is adorable…. got to get some!! !